Hope you all are doing well. 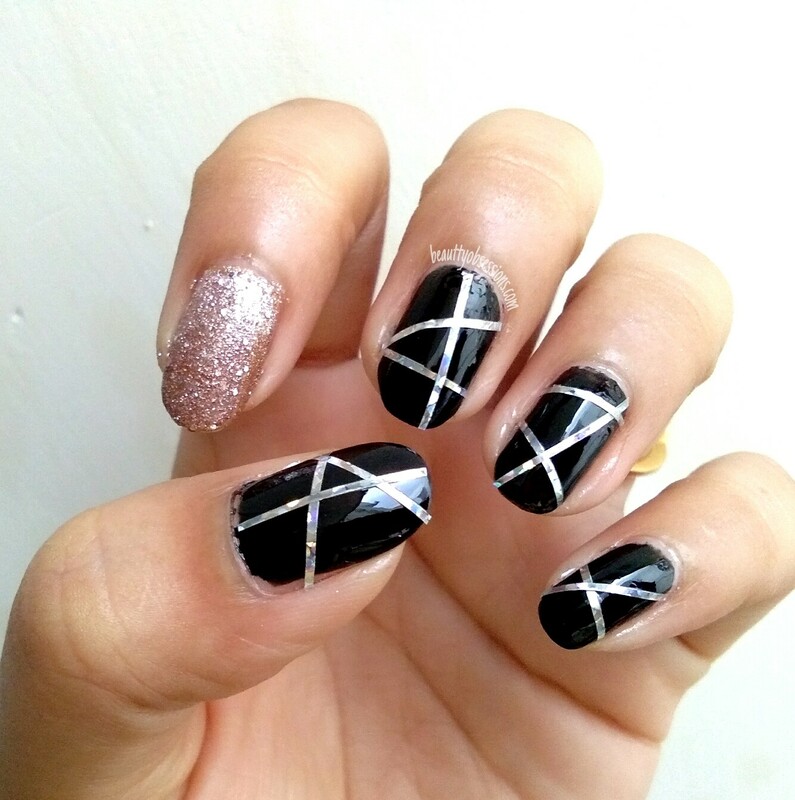 I am back with another nailart tutorial , in-fact this time two nailarts .. These two arts are really easy to create and hardly takes times and more over perfect for any parties or festivals.. You can rock these designs during this Navratri too. Here i have used nail striping tapes to create both the art but the out come and procedure is different.. 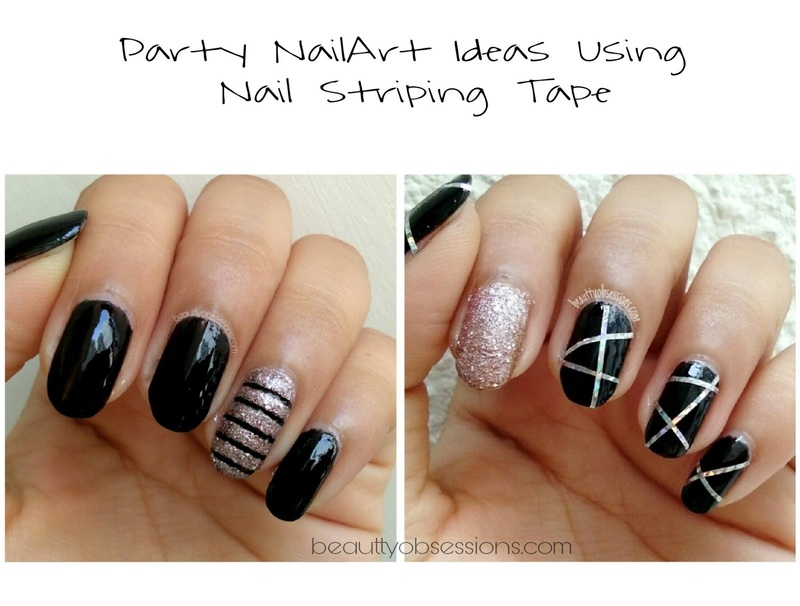 If you are very new ,then let me tell you something about nail striping tape.. Have a look at the below picture.. 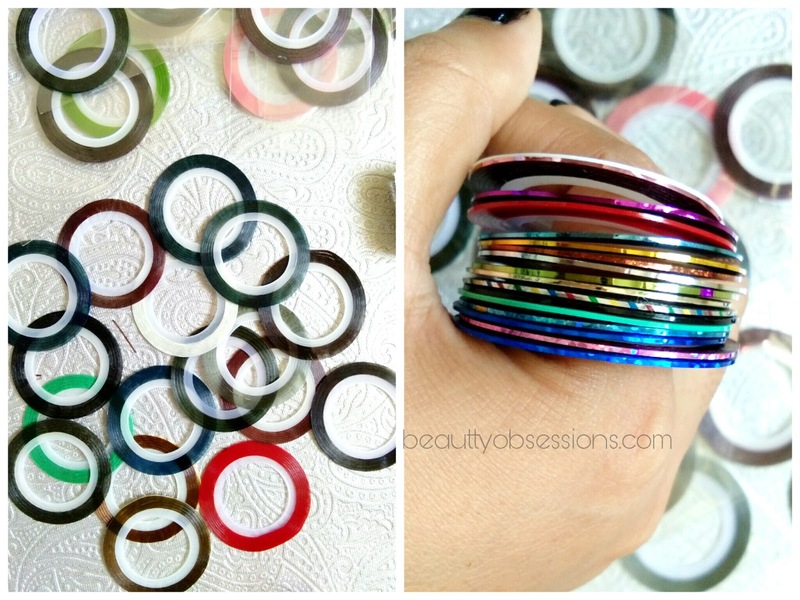 There are different width size nail striping tapes available and i have the thinnest size one.. There are different designs and colours stripes available as you can see in the picture .. you can use these in many ways to create beautiful nailarts.. 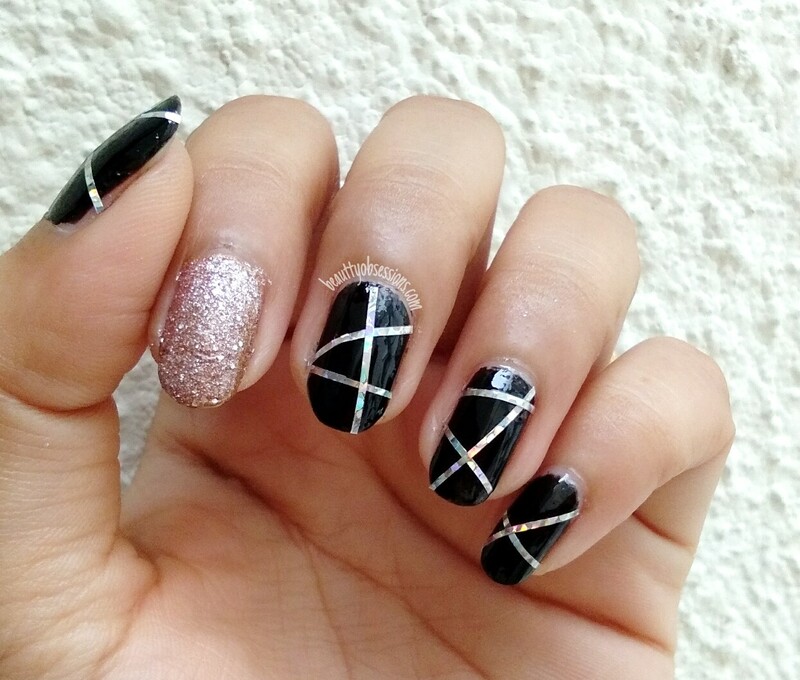 I have got these nail stripes from eBay.in and these are dirt cheap.. You can check amazon and flipkart too .. So let's get into the tutorials.. 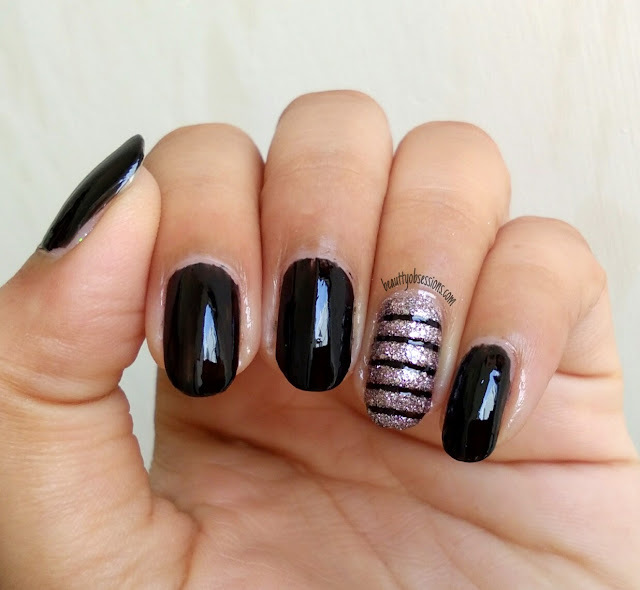 Here I have taken black as base colour and also used a glitter polish to create the art.. 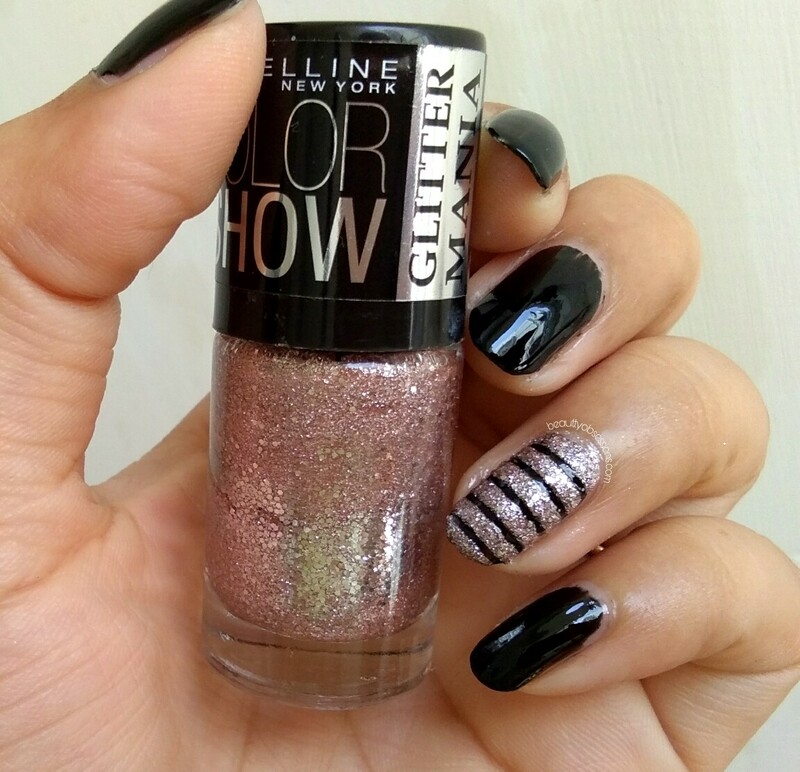 I have used Maybelline glitter mania Pink champagne on the ring nail .. First apply the back polish on all the nails followed by a clear base coat.. Then then wait till the polish is completely dry . Now take small pieces of the nail striping tape and carefully place horizontally on the ring nail over the black polish .. (Refer the picture..) . 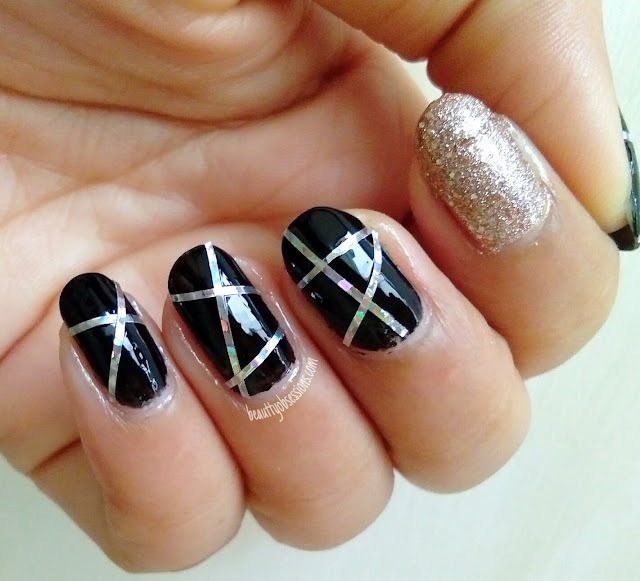 Then cut the extra tape and make sure it has placed properly on nail.. Now apply the glitter polish over it and gently remove the tapes though a twizzer . Now wait till the art will dry completely and apply a generous quantity of clear top coat to lock the art and to add shine to the nails.. Done.. Now see the final outcome.. isn't it easy and elegant ? 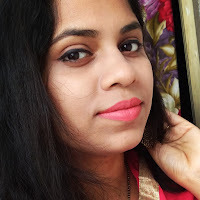 Here also I have taken black as base colour and has also taken that maybelline glitter polish.. 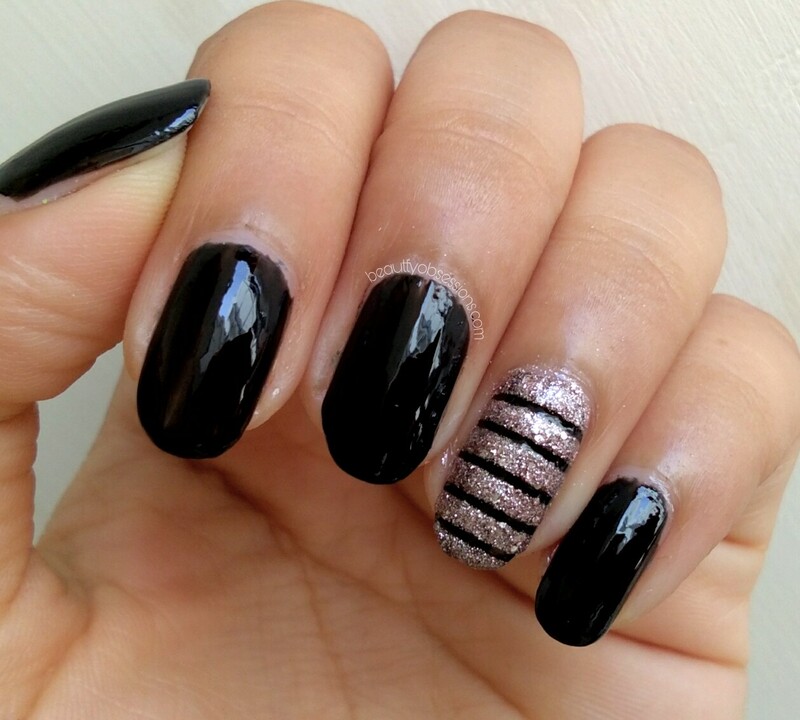 So first apply black polish on each nails except the index finger where i have applied the glitter polish.. Now wait till the black polish is completely dry.. Now take small pieces of a silver shinning striping tape and stick to the nails in random manner . Then cut the excess and stick properly.. wait a minute and apply a generous quantity clear top coat and voila..!! 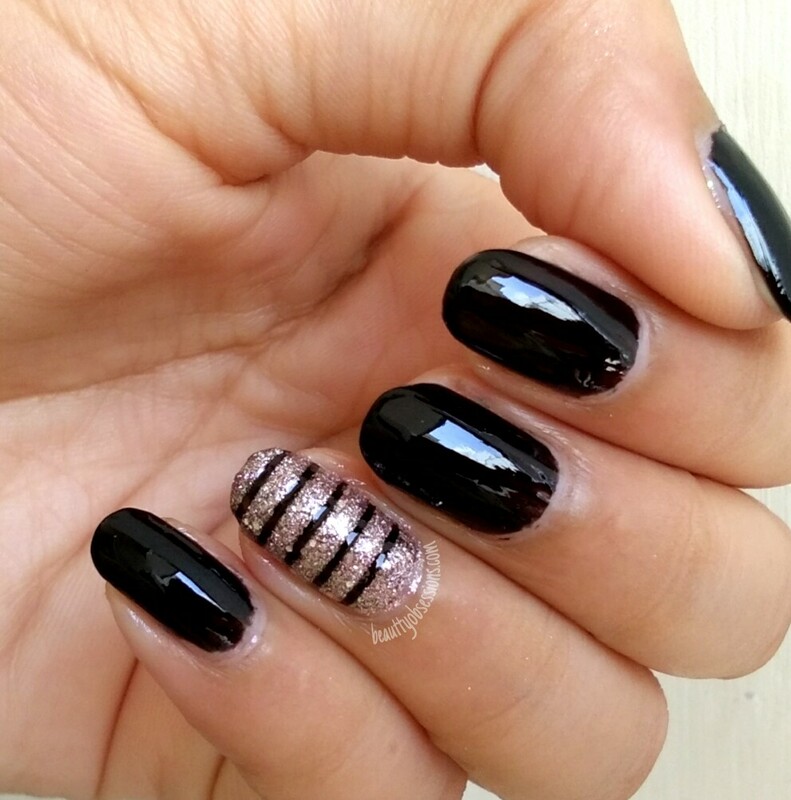 you are done..
Have you noticed one thing ,on both the designs i have used the same polishes and stripe but the outcome is totally different.. Hope you have liked both the nails.. Try these arts at home and enjoy this festive season..see you in some another easy-pisy nailart.. 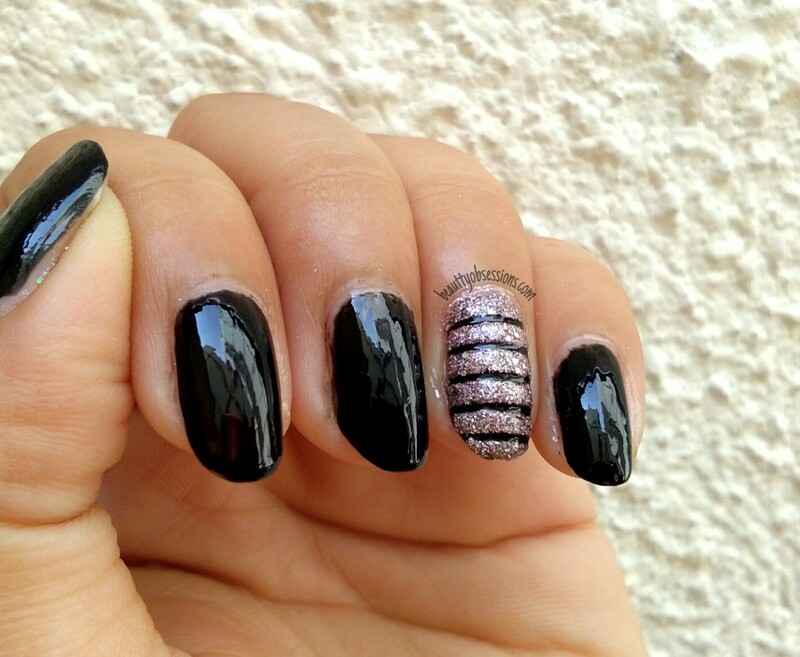 Simple but elegant nail art. Really like your creative art. I want those nail art strips.. Want to try this kind of nail art designs. Your nails look so lovely. I thought nail art was very tough but you made it easy with your tutorial. Thanks. Plz mujhy bataiye ki jo colourful tapes hain, unko peel off nahi karna hota na? Hum kaise bhi stick karke top coat se secure kar le na? I love the nail art. 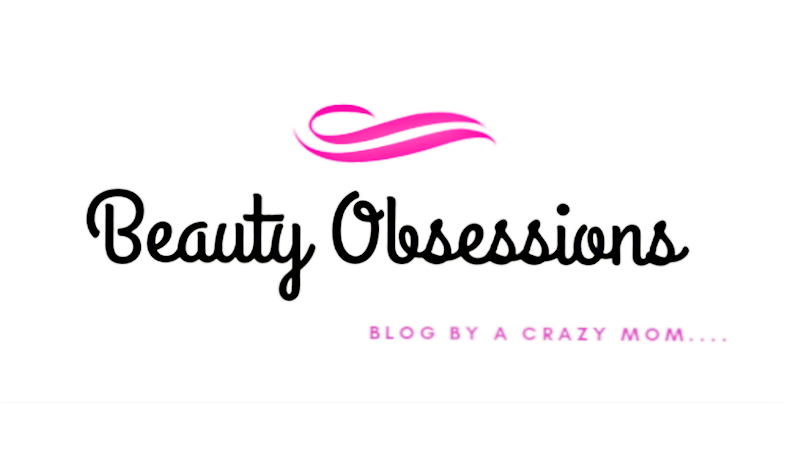 It has the perfect amount to glam to look gorgeous.